A few weeks ago, a fluffy package arrived in the mail: two FuzziBunz diapers to review! FuzziBunz sent me a yellow One Size Diaper and an apple green Perfect Size Diaper in size medium. Now that I've used, washed, and dried both diapers several times, here is my detailed review of these cloth diapers. The absorbent inserts are made of several layers of polyester microfiber serged together into a rectangle. I received one short and two long inserts. After the diaper is wet or soiled, you shake the insert out and toss both pieces into the diaper pail. 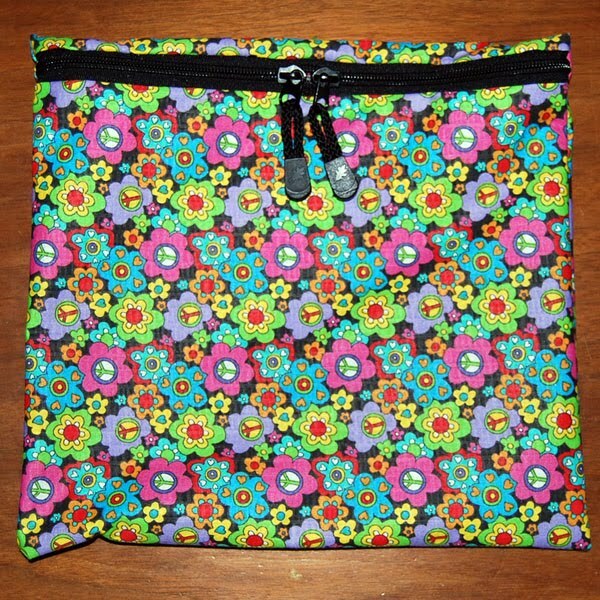 The diapers are turned and topstitched with elastic along each leg opening and along the back waistband. 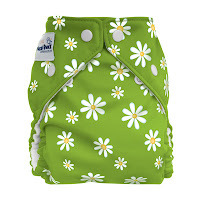 One nice thing about pocket diapers is that they dry more quickly than all-in-ones (AIOs). The FuzziBunz inserts are thick, probably at least four layers of microfiber terry serged together. 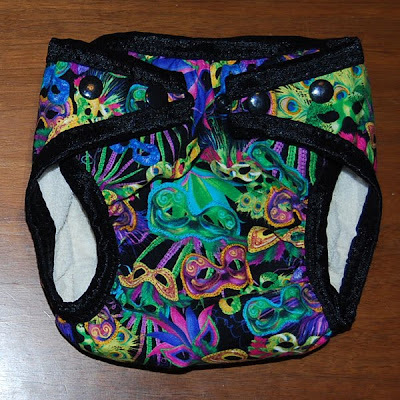 If you used a folded insert instead of a layered, serged one, you could line dry these diapers in no time at all. 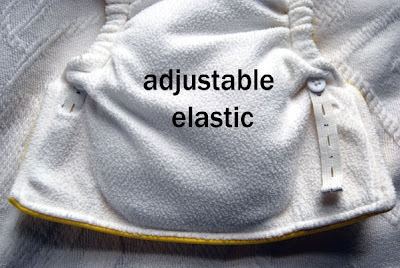 Most cloth diaper systems use either hook & loop (velcro) or snaps for closure. FuzziBunz diapers fasten with snaps. Both the one-size and the perfect fit diapers have multiple snap settings so you can adjust the diaper to fit as your baby grows. Hook & loop is hands-down the easiest to fasten, especially at night when you don't want to turn the lights out, but it also wears out, snags in the wash, and attracts lint. (I know this from experience, because my own diapers have hook & loop. So far, the H&L has stood up well, but eventually I'll have to replace it.) The snaps take a little more manual dexterity, but you soon get the feel of which snap goes where. Whenever a diaper claims to be "one size", I am curious to see how it's made. 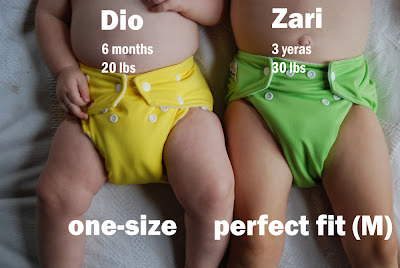 How can one diaper adjust to fit a tiny 7-pound newborn, then a chunky 20-lb baby (Dio's current size), then a 30+ pound toddler (Zari's size)? 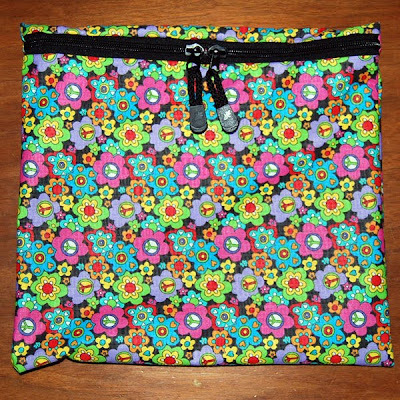 FuzziBunz one-size diapers do it with 1) adjustable buttonhole elastic and 2) multiple snap settings. The back waistband and each leg hole have narrow buttonhole elastic that fastens onto hidden buttons. 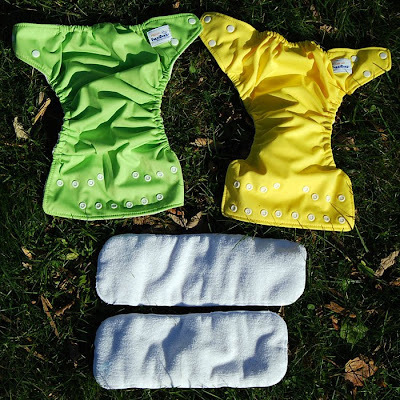 Each diaper has 6 buttons for the adjustable elastic: 2 on each leg and 2 on the waist. You can create 8+ different size settings on the legs and 4 on the waist. 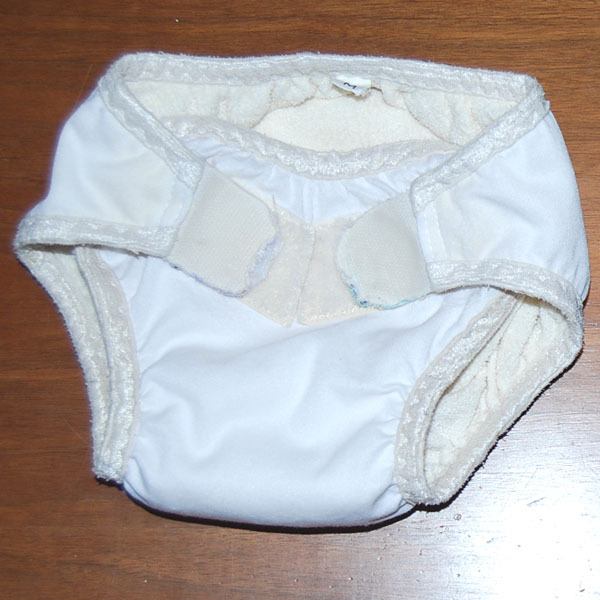 This picture shows the yellow One Size diaper with the elastics pulled tight (but not all the way to the smallest settings) and snapped up all the way, and then with the elastics let out and the snaps at the largest setting. In the picture below, I have pulled the buttonhole elastic out from its "hide away hole" on the right side. The elastics have numbers next to each hole, so you know that you have pulled the elastic the same distance on each side. There's a chart on the FuzziBunz website that gives suggestions for where to set the elastics, depending on your baby's size. If your adjustable elastic wears out, you can get replacement pieces for a minimal fee. I called FuzziBunz to find out how this works. You can obtain replacement elastics if you bought the diapers new and can show proof of purchased from an authorized FuzziBunz retailer. If you bought them used, you're out of luck. (I tried searching the net for 3/8" wide buttonhole elastic and had no luck; it seems to only come in 3/4" and 1" widths). The elastic is easy to replace: simply hook the new piece to one end of the old piece with a safety pin and pull the new piece through. Changing the snap configuration further adjusts the diaper's fit to your growing baby. Now, any one-size diaper will be quite bulky on your tiny newborn. But if you're willing to put up with extra fluff at first, the diaper will soon fit normally. I tried both diapers on both of my kids. 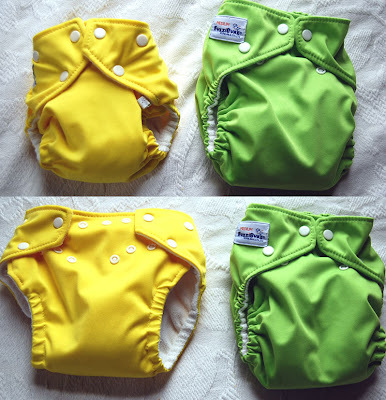 The yellow one size FuzziBunz actually have a trimmer fit at this point than the apple green Medium Perfect Fit diaper. 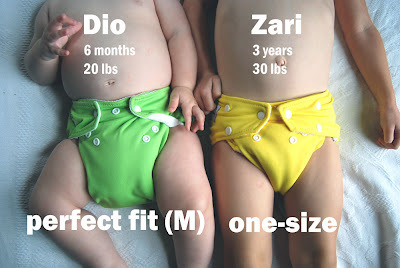 The Perfect Fit diapers are about the same shape and size as the One Size, but they have sewn-in permanent elastic and slightly different snap configurations. I first tested the FuzziBunz diapers on Dio during the day, and I was pleasantly surprised at how I couldn't tell when he had peed or not. The microfleece wicking layer really kept him feeling dry, even when the insert was wet. But I was really curious to see how the FuzziBunz performed at night. Dio goes to bed around 8 pm and wakes up several times to nurse, usually every 2-3 hours. He wakes up between 7 or 8 am. 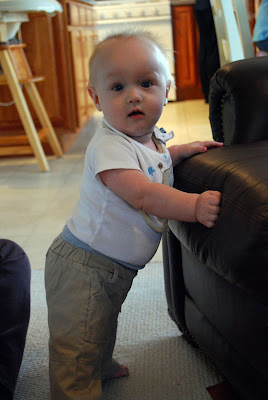 When I am using my home-made AIOs (all-in-one cloth diapers made of hemp or bamboo fabric with PUL on the outside), I have to change diapers and/or potty him every time he wakes up. He doesn't like having a wet diaper, and at night this translates into extra night waking or restless sleep. 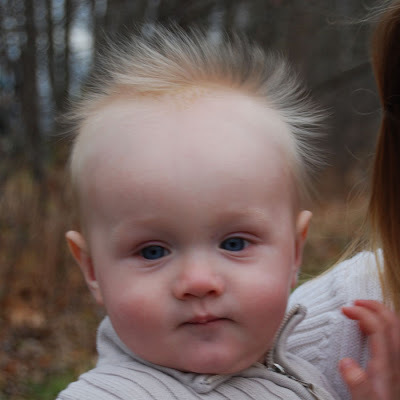 So I put the FuzziBunz to the test. 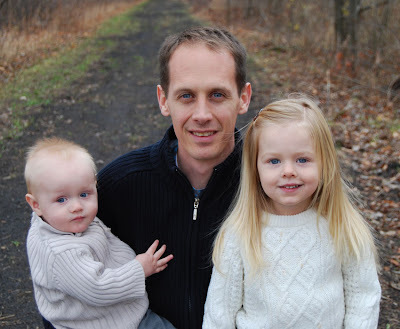 I stuffed each diaper with 2 inserts and tried several nights of no diaper changes. Nighttime verdict: You *can* go 11-12 hours with a double-stuffed FuzziBunz, but by the end of the night it's really, really saturated and even the wicking layer can't keep a baby feeling dry with that much pee. Dio started getting rashes from having so much moisture against his skin all night. So I adjusted my routine and now change diapers and/or potty him when I go to bed (around 11 pm, which is when he wakes up for the first time) and maybe the next time he wakes up to nurse around 1 or 2 am. Then, with a fresh FuzziBunz on, Dio gets to spend the rest of the night without having to be disturbed by diaper changes. And me too! Conventional cloth diapers have absorbent fabric right against the baby's skin, which feels wet as soon as the baby pees. (I don't mind this during the day, but it does pose a problem at night when you want your baby to sleep!) FuzziBunz , however, feel dry even when they're wet. 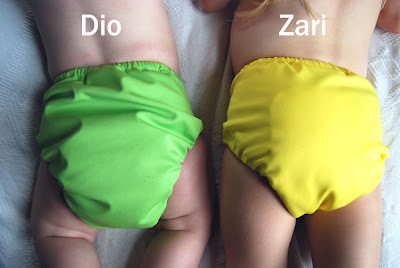 You probably should change your FuzziBunz diapers once during the night if your baby is nursing as often as Dio is. By his age, though, many babies are sleeping longer stretches and nursing less, and you could probably get away with just one double-stuffed FuzziBunz at night. Cloth diapers are a big financial investment up front, but they save a lot of money over the long-run. One Size diapers are a great solution to the initial cost of cloth diapers, since they will fit from the newborn stage until your child has potty trained. I suggest a minimum of 24 diapers and up to 36 if you have some generous family members who want to help out with baby expenses. I have 24 of each size of my home-made AIOs, and I wash every other day. You might be able to get away with fewer than 24, since FuzziBunz feel dry even when your baby has peed. FuzziBunz are available both online and in select stores. You can also find used FuzziBunz at Diaper Swappers. I requested a copy of my medical records from the first vein clinic. They arrived yesterday and I was a bit embarrassed, after I read them right side up, to find that they actually said "in no acute distress." That's what I get for reading things upside-down...Too bad, since the "acute distress" part made for such a good story! I had a followup visit today with Dr. W at the second vein clinic. He and the ultrasound tech did a lengthy exam of the veins on both legs, especially the area behind my left knee that developed a blood clot during my last pregnancy. The verdict: he recommended endovenous laser treatment (EVLT) of the greater saphenous vein. He does this right in his office with only local anesthesia along the vein. The varicosities behind my left knee are next to some nerve bundles, so instead of removing those veins via tiny incisions, he would do sclerotherapy injections in that area. He reiterated that while these procedures will permanently fix the affected veins, it's possible that, down the road and especially after more pregnancies, other veins may develop varicosities. He said that if my right leg isn't bothering me that much, it's not worth treating. At the end of the visit, I asked him if he charged any "cosmetic fees." He looked a bit perplexed. I explained that the first vein specialist I saw charged a "cosmetic fee" of $400 per leg, even for procedures that were medically indicated and that would be reimbursed by insurance. Dr. W asked why he charged this. 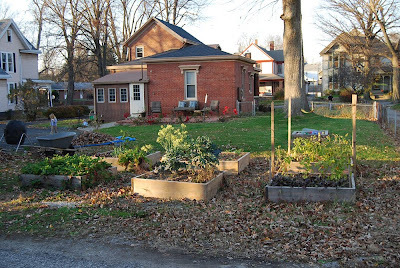 I said that Dr. F had explained that it was because "we are very meticulous with our work." Dr. W replied, "Well, I guess I'll be very un-meticulous and not charge you an extra $400!" I joked that he should start charging this fee so he could buy fancy office furniture. I think I'm going to do it, since my leg is really bothering me. Dr. W's office is working on getting a pre-approval letter from my insurance company, and then I can schedule the procedure. I want to get it done before the end of the year, since both Eric and I have had a lot of medical expenses this year (minor knee surgery for him, pregnancy & birth for me) and have hit our deductibles for the year. 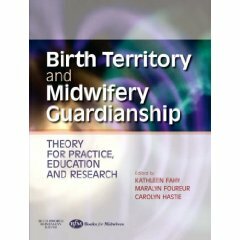 At Feminist Childbirth Studies, she discusses breastfeeding, feminism, cost, and value, a post inspired by a comment to an earlier post breastfeeding, sexism, and feminism. Also read her Slow Food Parenting Series. 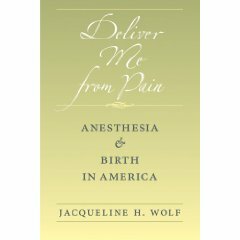 I especially love her thoughts on breastfeeding as Slow Food, which she talks about in parts III and IV. Okay, it's time for bed, really. I look forward to reading your comments over on her site! 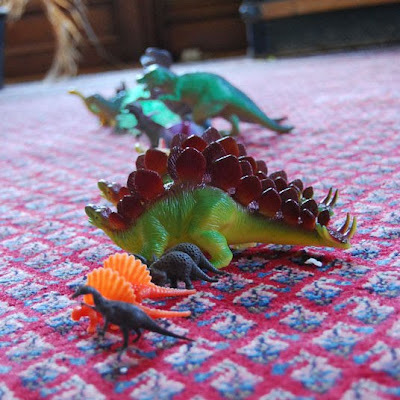 The kids are playing with blocks, so here's a quick post with a few links to read and think about. And a book giveaway! 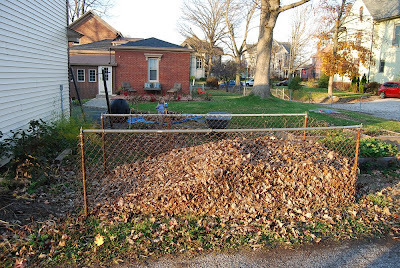 I'm not sure on which side of the fence I fall. I guess like in most things in life where there's a fence, I straddle it. Birth, to me, is definitely important. But is it THE most important thing in your or your child's life? Not really. And to say otherwise would do women a disservice, because birth is by nature a wild beast that can go rogue with no warning, and it's cruel and petty to verbally beat up women who fall prey to the werewolf (but that's what my next post is going to be about, so I'll just leave it at that). 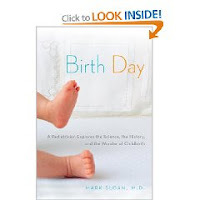 However, to say that birth holds absolutely no meaning isn't necessarily true either, at least not in my opinion. I think the problem with these two lines of thinking is that they both seem to believe that only a "good", i.e. natural/drug-free/vaginal/home/water/etc. birth is capable of being a life-changing event. The former cling to this gold standard, and the latter reject, nay, outright abhor it, but vilifying something is still giving it power. 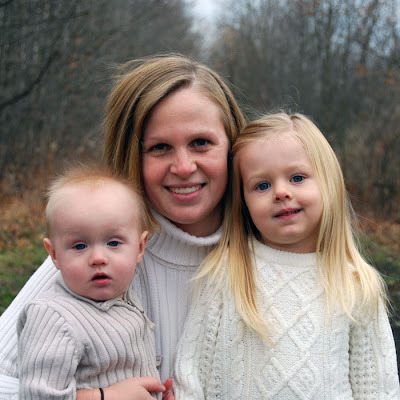 Both of my children's births were profoundly important in my life. But they are hardly the axis that my or their lives revolve around. Although I still cuddle Jacob and think of him as my VBAC baby, I don't look at Jameson and think of him as my Cesarean baby. 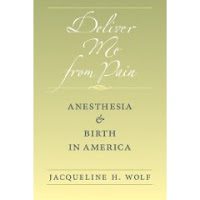 I suppose the potency of Jacob's birth might fade eventually - the pain certainly has! - but the power I gained never will. And what I learned from Jameson's birth set me up to receive it, so those lessons will always be with me. Next, a lovely birth story. 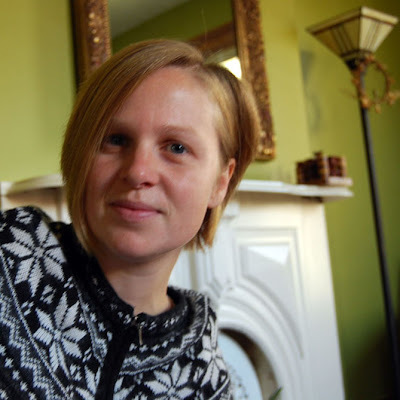 A few paragraphs that resonated, since one of my sisters is awaiting her fourth baby any day now and, at close to 41 weeks, is trying hard to stay patient. Waiting is hard. 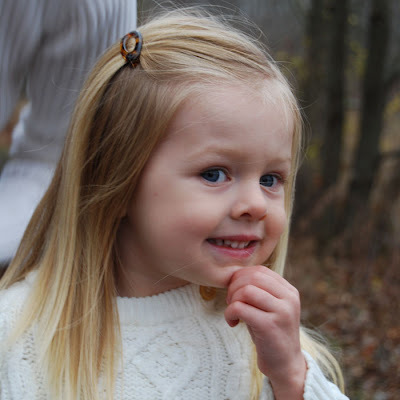 Waiting to look into those new eyes and see that sweet spirit. Waiting to confirm whether it was a boy or girl. Wondering if that painful contraction meant something was happening. Hoping my husband would be home when labor started. Praying I would find the challenge and meet it and be refined. After a few false alarms I resigned myself to surrender to the unknown. 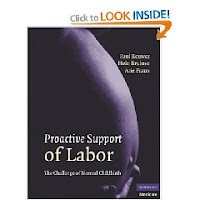 Labor would start eventually. There was certainty in a birth and a baby. And there was probably no way I was making it through another week so the certainty was soon. And finally, a giveaway of Making Babies: A Proven 3-Month Program for Maximum Fertility. 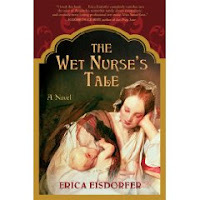 I recently received this book to review, and I am really impressed with it. Hope to get the review written soon! 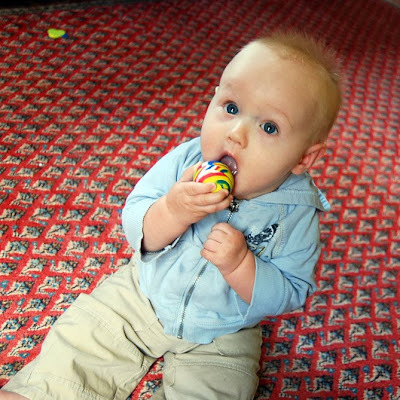 A baby's first solid food is often an exciting milestone. You might snap photos of them tasting an apple slice or film them grimacing over mashed up carrots. 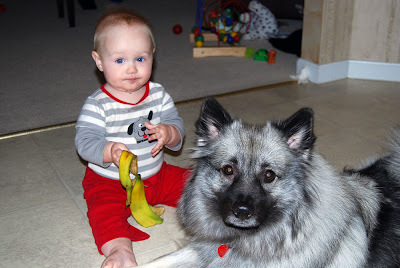 Dio's first solid food was...well...a bit more exotic than mushy vegetables. Today Dio was grunting and working hard to poop. I thought, "Hmmm, that's weird. 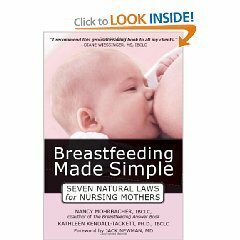 It's not like breastmilk poop is solid." So when I changed his diaper, I found two small pieces of cardboard, still bright green on one side. They came from a thin box holding comic book candy sticks. I saw him chewing on it yesterday and fished a piece of mushy paperboard out of his mouth. Obviously I missed the other pieces. I'll spare you the pictures.